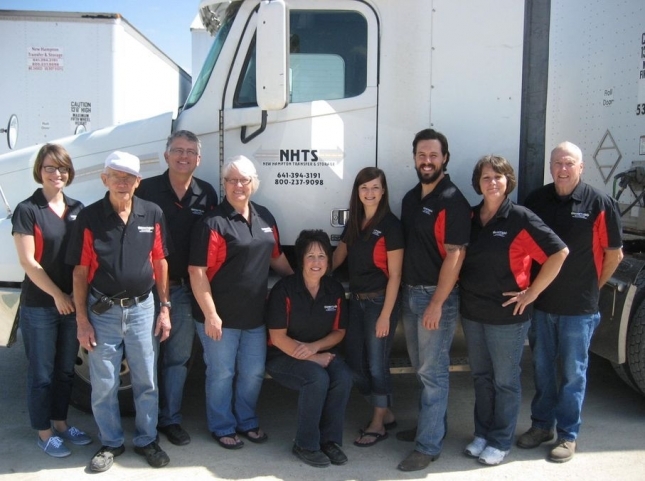 New Hampton Transfer and Storage (NHTS) was started in 1968 as a small family owned warehousing and distribution business serving local Northeast Iowa. Since our opening, NHTS has grown and now handles supply chain functions for companies throughout the United States, Canada, and across the globe. Our goal is to continue to meet the needs of the global supply chain market while still providing the best customer service possible at the best price. At New Hampton Transfer and Storage, we take pride in offering consistent, high-quality, personalized service. Our staff exhibits the Heartland's hard-working value and strives to exceed the expectations of every customer. We thank you for giving us the opportunity to work with you. Please feel free to contact us to discuss how we can help your business improve its warehousing, supply chain and logistics processes. Check out our home page's slideshow to see how we have grown over the last 45 years!! 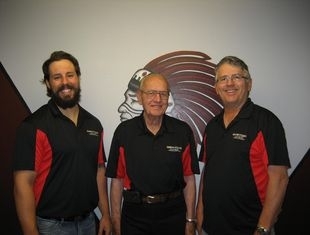 And meet our three generations of owners; Ray, Chip, and Jonas! Jonas is our CEO and Manager of New Hampton Transfer and Storage. He is our third generation family owner/operator. He was born and raised in New Hampton, attended The School of Business at the University of Iowa and received two degrees in Marketing and Management with a Certificate in Entrepreneurship upon graduation in 2007. In 2008, Jonas bought into the family business and has since helped NHTS grow their customer base and storage capacities. We are very lucky to have someone so driven and dedicated to quality and great customer service! William "Chip" is our Assistant Manager and co-owner of NHTS. As Jonas' father, Chip is our second generation to own and operate our storage business. He was also born and raised in New Hampton. After graduating from New Hampton High School in 1970, Chip attended Iowa State University and received his MBA in 1974. In that same year, he returned to New Hampton to take over NHTS and started his own reception/dance hall which is well known around the area as "Chips" for 26 years. Chip's charisma, character and forward thinking has been and continues to be a tremendous asset to our company! Ray is our first generation and started New Hampton Transfer and Storage in 1968. He is from rural community close to New Hampton and served in World War II. After the war, he and his wife settled in New Hampton to grow their family. He held numerous occupations during his long career, amongst hauling feed, running trips for the Iowa Parcel Service, working on cars, being an electrician, and owning our storage/distribution business. "Grandpa" is a proud member of our team, always beaming with joy to drive loads to and from our customers, and a constant chair filled in our office! Darlene, our financial manager, has held an active role in NHTS since 1977 when her and Chip were married. She has worn many hats over the years from secretary to billing manager to now our CFO. Darlene is probably the hardest worker in the world and her attention to detail makes her an outstanding accountant. You won't always see her face in our office, but she solely handles all of our behind the scenes work. Bonnie, our Warehouse Lead, has been part of our team since 2001. She has a great history of inventory management and warehousing from her many years working at Sara Lee when it had a factory in New Hampton. Bonnie maintains our warehouses and storage spaces and manages all in and out loads for our customers. We are so thankful to have Bonnie on our team and her positive, laid back attitude and great work ethic have definitely helped us to be successful. LuAnn is our Office Lead, a member of the team since 2007. She is also from New Hampton originally and has strong ties to the community. "Lu" takes care of scheduling, directing customers, and maintaining our digital inventory. Bonnie and LuAnn work closely together to make sure every customer inventory is always 100% accurate. LuAnn has been a valuable asset to our team and keeps us organized and neat. Bill was our Warehouse Assistant and helped us part time for almost 20 years. Chip's uncle, "Uncle Willy" as we called him, served in the U.S. Navy and then worked for Supersweet Feeds for 35 years. Although he is no longer with us, the memories and stories we have of him will always bring a smile to our faces. His dedication and sense of humor is something that can never be replaced. We were all extremely lucky to have been able to know and work with this man; he is greatly missed by his NHTS family. Megan, Chip and Darlene's daughter, has been with us for two years. She has taken over as our marketing specialist. She graduated from Arizona State University with a B.S. in Management and a B.S. in Real Estate in 2005. Megan has been helping us streamline our processes and increase our brand exposure. We are glad to add another branch of our family tree to our business. Kacee joined our team in late July of 2014. She has been working along side Megan on marketing projects to help spread the word about NHTS. She is also training in our accounts receivable and accounts payable department. She attended Hawkeye Community College for general education, and will continue her education to help make our office processes as efficient as possible. Dave is our semi driver. He joined us in mid September of 2014, with over 40 years of driving experience and around 6,000,000 miles under his belt. With his happy and helpful attitude he makes a great addition to the NHTS team. In addition to driving he is training to help with a variety of tasks around the yard and in the warehouse, to say the least we are more than happy to have "Orville" on board. Ethan is our part-time team member. He is currently attending New Hampton High School and chooses to spend his free time helping us. Ethan is an extremely intelligent young man with a passion for computers and IT work. He has upgraded our office computer system and processes to levels we didn't think were possible. He continues to surprise us each week, and with his hard working and helpful attitude he has even been able to teach a few of us 'old dogs' some new tricks! Interested in joining our family. Contact us to see if we are hiring. Fill out the application below and return to us at our office by mail or email.